There is a lot going on at Starnberg Fellowship! Please read and forward to your friends and visit our Facebook and website to share our events with others or for more info! Any questions, please ask! 3 March – This Sunday, Pastor John will be leading us in a study on Psalm 107. Prayers for those away this weekend. The next Coffee and Conversation Morning will be Wednesday, 13 March from 10:00-12:00 here at Christuskirche. Children are welcome! And mark your calendars for the following days: 10 April, 8 May, and 5 June. Youth Group Night! Our first Youth Group Night is Sunday, 10 March following worship, 17.00-18.00. Come play some games, eat some snacks, and talk about Jesus. We’ll also be discussing Jam Session events for Spring. Ages 12 and up. Friends are always welcome! 17 March – St. Paddy’s Day Potluck Dinner following worship! Please bring your favorite St. Paddy’s Day dish and a beverage to serve 8-10 people. 31 March – As our last Sunday of the month outreach event, we will be joining Amnesty International for their #Chilipalooza – The hottest cooking competition in Munich, from 12 PM – 6 PM at The Keg Bar, Trautenwolfstr 1, Munich. It’s a family-friendly event! Some of our youth will be joining Sarah and Stephanie to provide music for the event. Please let Sharon Page or Shirin know if you can be there so we can look out for you! What: An event for students, writers, and bloggers is to receive intensive instruction on topics of writing – non-fiction, fiction, and blogs. 21 April – Join us for our special Easter celebration and Easter Egg Hunt! If you’d like to contribute to this event, please see Shirin. Watch for details on our Back to the Future Fundraiser—Coming Soon! Grateful Thanks! Sarah and Stephanie thank you for your prayers and encouragement!! 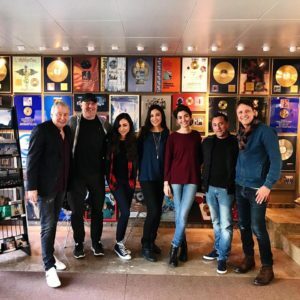 They are thrilled to announce that they’ve just signed with Muve Recordings (https://muve.ch/portfolio-item/deer-park-avenue/). They are honoured to be part of a stellar team of people and on a roster with some incredible artists.